The Works, the music production company, is vying for the attention of the heads of TV production at creative agencies in London by spray painting a personalised message outside their offices. The Works launched the campaign to get the attention of TV production leaders at 10 agencies including BBH, Ogilvy and Fallon this week. Chalk stencils were used to spray graffiti images on pavements outside agencies. 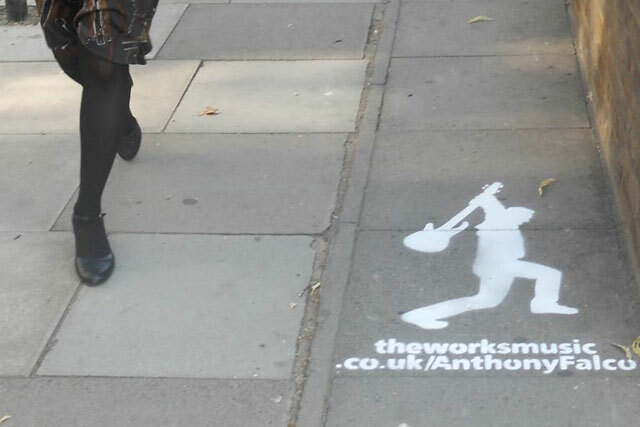 The images feature a rock 'n' roll guitarist and the url for a dedicated page hosted by The Works website, www.theworksmusic.co.uk. The web page showcases The Works' roster of artists, its latest show reel and an introduction to the company. The Works devised the campaign because the heads of TV production departments are "notoriously hard to get hold of," and claimed they had made "dozens" of phonecalls with "limited success". Nick Payne, senior producer at The Works, said: "Just as ad agencies go out of their way to make a big impact on their chosen target markets, we decided to take a leaf out of their book and make our own impact. In March this year, Unilever reviewed its relationships with TV production companies by building its own roster, rather than using those recommended by its ad agencies.